Lighthouse Trails Research PRINT JOURNAL: Our low-cost subscription-based print journal is mailed out to homes and offices 6 times a year. The 32-page journal contains the most important stories from our e-newsletter from the previous 8 weeks and also other features. You may wish to receive that in addition to this free e-newsletter. You can sign up any time during the year for the print journal. You can also buy individual or past issues here. Many people have now signed up for the print journal, and we are getting very favorable feedback that the journal is most beneficial. For common questions about the journal, click here. This week's Lighthouse Trails e-newsletter is a little different than usual. Rather than presenting you with several articles on various topics, we are going to focus on just one topic—the book Jesus Calling by Sarah Young, which has practically become a movement within evangelical Christianity. As you read further into this newsletter, it will become clear why we are devoting an entire issue to this situation. You will be especially moved as you read the story of a woman who called Lighthouse Trails recently and shared with us what happened to her because of Jesus Calling. Because millions of Christians have now read Sarah Young's book and millions more will be reading it in the future, and because Sarah Young and her publisher, Thomas Nelson, are targeting children with the 365 Devotions for Kids, and because there is even a Jesus Calling Devotional Bible on the market now, we are compelled to take this matter seriously and pray that all of our readers will too. If you have never read (or even heard of) Jesus Calling, you may be inclined to think this has nothing to do with you. But we cAN almost guarantee that most of you know someone who is reading this book. You see, ever since we released Warren B. Smith's book last year, "Another Jesus" Calling, we have had numerous phone calls and e-mails from mostly women (some men) who have told us they have given multiple copies of Jesus Calling away to friends and family. We must admit, we were surprised at how many of those kinds of calls we have received. As you read the information below, you are going to see the name Warren B. Smith quite a bit. As a former New Age follower, Warren and his wife Joy have committed their lives to Jesus Christ and to warning others about the false christs that are deceiving masses of people and coming in the name of the true Jesus Christ. We know for Warren Smith or Lighthouse Trails to take on mega publishers like Thomas Nelson (actually HarperCollins, its owner) is risky and may even appear foolhardy to some. And as you read the content of our newest Booklet Tract titled Changing Jesus Calling (see below), you will see just how important the Jesus Calling project is to Thomas Nelson. But we remember the following passage of Scripture, and it compels us to do all we can to warn others "so that some may be saved." Note: You may have read some of the articles below already as some of them are reposts. But for those who missed them, we are including them in this special "Jesus Calling" edition. We'll call her April, but that's not her real name. Although we have received many calls since we released "Another Jesus" Calling last year that contain elements of what April told us, her story is the essence of all those stories put together. We have paraphrased her comments below as we do not have them word for word, but we have maintained the accuracy of what she told us and captured a close rendition of how she worded her comments. April began reading Jesus Calling many years ago, and soon it became a part of her every day devotions time. You see, April loves the Lord and spending time with Him praying and reading His word have been very important to her. As the years passed, April shared readings from Jesus Calling with others, and in time even bought and gave copies away. But after awhile (she didn't notice it at first), April found herself less and less interested in reading the Bible and more and more drawn to reading Jesus Calling. In fact, she told us she got to where she had to read Jesus Calling everyday. "Did you feel somewhat addicted to it," we asked her (we asked this because other callers had told us they had felt addicted to the readings). "Oh yes, that's a perfect way to describe it," she answered. "I had to have my Jesus Calling fix." Eventually, she hardly picked up her Bible at all. But she continued to be more and more drawn into Jesus Calling. When we asked her what attracted her to the book when she first started reading it, she said, "From the very first time I read it, it made me feel so good about myself . . . and one day, after reading it for some time, I realized that Jesus wasn't just my Lord and Savior . . . he was my boyfriend!" As April faithfully went to her prayer closet, she began practicing meditative contemplative prayer (which Sarah Young promotes) and started having mystical experiences. She told us she went into altered states. She told us that she often, especially the last few years, felt a restlessness and uneasiness about these experiences and even about reading Jesus Calling, but she couldn't put her finger on anything and thus ignored these troubling thoughts. One day, April did pay attention to those restless uneasy feelings she was having and began researching Jesus Calling on the Internet. She came across Warren Smith's writings, and her eyes were opened to the deception she had fallen under. She told us she realizes she had been seduced by what the Bible calls "seducing spirits" (1 Timothy 4:1). We are happy to say that today April has become a discerning believer and realizes just how easily it is for even a sincere Christian to become spiritually deceived when she takes her eyes off of God's Word and begins following a different voice. However, we have received many other calls of similar nature related to Jesus Calling, and we continue to be concerned about these other men and women. It is to April and the many other women out there like her that we dedicate this issue. Lighthouse Trails is a Christian publishing company and research project ministry. We work with a group of Christian journalists and authors, all who understand the times in which we live from a biblical perspective. While we hope you will buy and read the books we have published, watch the DVDs we have produced, and support our ministry, we also provide extensive free research, documentation, and news on our Research site, blog, e-newsletter, and now our subscription based print journal. We pray that the books as well as the online research will be a blessing to the body of Christ and a witness to those who have not yet accepted Jesus Christ as their Savior and Lord. Changing “Jesus Calling”—Damage Control for a False Christ by Warren B. Smith is our newest Lighthouse Trails Print Booklet Tract. The Booklet Tract is 16 pages long and sells for $1.95 for single copies. Quantity discounts are as much as 50% off retail. Our Booklet Tracts are designed to give away to others or for your own personal use. Below is the content of the booklet. To order copies of Changing “Jesus Calling”—Damage Control for a False Christ, click here. In the fall of 2013, my book “Another Jesus” Calling was published by Lighthouse Trails Publishing. I was not the first person to express concern about Jesus Calling, but not much had been written up to that point. As our concerns were publicized, Sarah Young and Thomas Nelson obviously became aware of our objections. Without a word of explanation to anyone, significant alterations have been made to recent editions of Jesus Calling. With “now you see it, now you don’t” editing, some of their major problems suddenly disappeared from the pages of Jesus Calling. To illustrate the lengths to which Sarah Young and Thomas Nelson have gone to protect their book and their multi-million dollar Jesus Calling industry, I will provide five specific examples—and there are many others—to demonstrate how readers of Jesus Calling are being managed and manipulated. Make no mistake about it—damage control is in full swing at Thomas Nelson, and it is especially evident in their special 10th anniversary edition of Sarah Young’s book. Note: For Sarah Young to not have initially recognized God Calling as a New Age book should raise some serious red flags. For her to praise God Calling as “a treasure to me” should raise those red flags even further. But for Sarah Young and her publisher to remove all references to God Calling without any explanation or apology to her millions of readers is perhaps the reddest flag of all. 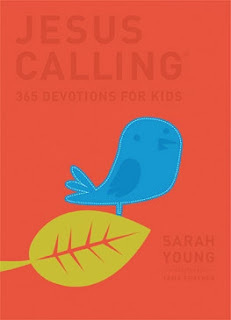 It is the height of spiritual irresponsibility for Sarah Young to pretend it is no big deal after her original endorsement of God Calling re-ignited the sales of this blatant New Age book, especially when God Calling—thanks to her—now sits alongside Jesus Calling in thousands of bookstores across the country—including countless Christian bookstores. Because of Sarah Young’s stated affection for the channeled “messages” in God Calling, the “messages” she was receiving from “Jesus” were immediately suspect. In the example immediately below, observe how “messages” again become “devotions” in the replacement sentence now found in recent editions. Also note how the phrase “with your Bible open” has been added to the original wording to make things appear more biblical. Summary: Changing the “messages” she “received” to the “writings” and “devotions” she “gleaned” in her “quiet moments” attempts to counter any suggestion that Sarah Young might be getting deceived by a seducing spirit that is presenting itself as the real Jesus (1 Timothy 4:1, Matthew 24:4-5). In two separate messages, Sarah Young was told by her “Jesus” that the last words he spoke after his resurrection and before ascending into heaven were “I am with you always.” But this statement made by the true Jesus Christ on the Mount of Galilee were not His last words before ascending into heaven. His last words were spoken from the Mount of Olives as recorded in Acts 1:7-9, 12. The two “messages” Sarah Young received from her “Jesus” contradict the words of the true Jesus Christ in the Holy Bible. What her “Jesus” said was totally unbiblical. Sarah Young might argue that because Jesus never contradicts Himself, she must have heard it wrong. But if that were the case, she had to hear it wrong on two separate occasions because the unbiblical statement is in two different messages. With this in mind, an important question must be asked. Who was Sarah Young listening to when she “received” these two “messages?” Obviously the real Jesus does not contradict himself—much less correct Himself in regards to His own words and actions. And for those who might argue that there is no longer a problem because this contradiction and other problematic areas have been corrected, several more questions must be asked. What about the ten million readers who have trusted these unbiblical messages over the last ten years? Do you just pretend it never happened? Aren’t they owed some kind of explanation as to how Sarah Young’s “Jesus” could make mistakes of this magnitude. But perhaps most importantly, how can an author and publisher—or anyone for that matter—believe they have the right to put words in and out of the mouth of Jesus Christ like He is some kind of literary device—and most especially when it is for the purpose of damage control? Regardless of whether Sarah Young has been listening to a deceptive spirit (1Timothy 4:1) or to her own confused thoughts (1 Corinthians 14:33)—or a combination of both—she is deceived and is, in turn, deceiving others (2 Timothy 3:13) whether she realizes it or not. Believers must search the Scriptures to see if the things they are being told are really true (Acts 17:11), and they must test the voices they are listening to “because many false prophets are gone out into the world” (1 John 4:1). Sarah Young’s “Jesus” said that Abraham was a man of “undisciplined emotions” and was guilty of “son-worship” and “idolatry.” Many believers have recoiled at these strange, extra-biblical remarks. Sarah Young and Thomas Nelson have attempted to make this particular problem disappear by deleting all references to Abraham and Isaac in the August 23rd message in Jesus Calling.” As they eliminate Abraham and Isaac, they are simultaneously cutting, pasting, and inserting Jacob and Joseph in their place. Compare the original August 23rd entry with the one that has replaced it in recent editions. Note: Sarah Young and her editors obviously made a determination that substituting a toned down Jacob and Joseph entry would be more plausible than the original Abraham and Isaac message. However, the obvious cut-and-paste damage control has resulted in bringing more attention rather than less to their extra-biblical problem. The complaints made by Sarah Young’s “Jesus” don’t square with Scripture inspired by the true Jesus Christ. The Bible tells us “to be content” in whatever circumstances we find ourselves (Philippians 4:11). Obviously succumbing to the mounting criticism regarding the “dark night for Me” remark, Sarah Young’s “Jesus” corrects himself—again—with no apology or explanation. Intrigued by the channeled messages of God Calling, Sarah Young was apparently not satisfied with the sufficiency of God’s Word. In her original introduction, Young stated: “I knew that God communicated with me through the Bible, but I yearned for more.”27 While this statement—along with many others—has been deleted in recent editions, it is clear the author of Jesus Calling “yearned for more,” and more is what she got. As a result, she received “messages” from a “Jesus” that has proven himself to be one of the false Christs that the real Jesus Christ warned us to watch out for (Matthew 24:4-5, 23-24). Wanting a word from God more than the Word of God, Sarah Young ended up getting deceived. “Deceiving, and being deceived” (2 Timothy 3:13), she has taken millions of Jesus Calling readers along with her. The Bible describes those who love and respect the power and authority of God’s Word as those who tremble at God’s Word (Isaiah 66:2). The Bible also describes those who do not tremble at God’s Word but rather use and manipulate God’s Word for their own selfish purposes (2 Corinthians 4:2). There is no nice way to say it. Jesus Calling is a gross affront to our true Lord and Savior Jesus Christ. And the self-serving effort by Sarah Young and her publisher to cover up some of the many problems found in Jesus Calling is a gross affront to the body of Christ. It is one thing for Sarah Young to be deceived, it is quite another for her to be the author of deception herself. Jesus warned that great deception would characterize the time of the end and that the deception would come in His name. I am absolutely convinced that the “Jesus” of Jesus Calling is not the true Christ. Rather he is one of the false Christs that the real Jesus warned us to watch out for. To order copies of Changing “Jesus Calling”—Damage Control for a False Christ, click here. 8. Ruth Graham, “The Strange Saga of ‘Jesus Calling,’ The Evangelical Bestseller You’ve Never Heard Of” (Daily Beast, 02/23/14). (http://www.thedailybeast.com/articles/2014/02/23/the-strange-saga-of-jesus-calling-the-evangelical-bestseller-you-ve-never-heard-of.html). 10. Jim Fletcher, “Top Christian Bestseller Accused of Heresy” (WorldNetDaily, http://www.wnd.com/2014/05/top-christian-bestseller-accused-of-heresy). 11. Jim Fletcher, “Is Hit Book ‘Jesus Calling’ Pushing New Age?” (WorldNetDaily (http://www.wnd.com/2014/06/is-hit-book-jesus-calling-pushing-new-age). 12. Gina Meeks, “Critics Accuse ‘Jesus Calling’ of Mixing Truth With New Age Error” (Charisma News, http://www.charismanews.com/culture/43855-critics-accuse-jesus-calling-of-mixing-truth-with-error). 28. Dr. Harry Ironside, “Exposing Error: Is it Worthwhile?” (TBC Extra, April 2008, posted on The Berean Call website, http://www.thebereancall.org/content/tbc-extra-30). Every believer should read and digest Warren Smith’s newest book, ”Another Jesus” Calling ( Warren Smith, Lighthouse Trails Publishing, Eureka, Montana, 2013, 174 pages, $12.95). It gives insight from a former New Ager about the way in which New Age thought and terminology is infiltrating and permeating the Christian church at large. Sadly it is all being done through publishers, book stores and books that are supposed to be Christian. The allure of these questionable books is often a veneer of Bible terms, a promise of deep inside information and the excitement of a current mystical trip with personal impressions and perhaps even voices from the beyond. Jude 4 warns about those false teachers and spiritual counterfeiters who “secretly slip in”. The antidote of course is to “earnestly contend for the faith once delivered d to the saints”, (verse 3). John Benton’s statement is surely as true today as when Jude wrote; “The church was being corrupted by false teaching and false teachers. If the truth is lost or perverted then the devil will have halted the work of salvation”, (Slandering Angels The Message of Jude, Evangelical Press, England, 1999, page 54). Warren Smith is a graduate of Tulane University and a former New Age insider and practitioner. He clearly understands the major mystical philosophies and themes being brought into the church today. Some of these masquerade as the voice of Jesus but upon biblical examination show themselves not to be what they claim but rather another voice from another place. Are we to look for voices or look at verses? One has to wonder if these experiences are fabricated, imagined or worse yet demonic. Click here to continue reading this book review. When the entity formerly known as the Christian Bookseller’s Association decided to go secular business model a couple decades ago, the inevitable diluting of doctrinally sound books began. Traditional titles, ranging from Charles Stanley to Ruth Bell Graham to Charles Spurgeon, began to share shelf space with the “Chicken Soup for the Soul” books (musing about such things as the “golden Buddha inside us all”). Pretty soon, it was a theological free-for-all, with no vetting process in place. Anyone self-identifying as “Christian” was welcome. The transformation was complete by, say, 2008, when CBA (newly named as “ICRS”: International Christian Retail Show) feted “The Shack” author William Paul Young and his universalism beliefs. So it is that Sarah Young’s wildly popular book, “Jesus Calling,” first published in 2004 by Thomas Nelson, has now sold more than 10 million copies. It has spawned almost countless spin-off products and seems to be gaining steam, featured as it is in Christian bookstore chains and recommended by prominent leaders. But is something amiss here? Researcher and writer Warren Smith thinks so. His response to Young, “Another Jesus Calling,” presents the case that the mega-seller is soaked in New Age teachings. He makes a compelling case that “Jesus Calling” was influenced by a decades-old title, “God Calling,” in which the authors introduce mainstream New Age teachings to Christian audiences. Click here to continue reading. Countless references to meditating, being quiet, being still, relaxing, resting, letting go, and reciting Psalm 46:10 are found throughout God Calling and Jesus Calling. They are all suggested ways of entering into the silence to experience God’s presence. The New Age/New Spirituality likewise places great emphasis on these same ways of entering the silence in order to experience God’s presence. It is a simple fact that many of the teachings and communications we received in the New Age were channeled during meditative and contemplative quiet times when we were absorbed in the silence. In our New Age meditations, we would sometimes meditate on and contemplate certain passages of Scripture. At an Edgar Cayce conference I once attended, we began each day by meditating on Psalm 46:10—“Be still, and know that I am God.” Looking back on that experience now, I understand why that particular Psalm was used by so many New Age groups for contemplation and meditation. The spirit world was only too willing to take something the true God was saying about Himself and translate it into something the occult/New Age was saying about man. It was a very clever tactic. Click here to continue reading. Here is something to seriously consider for parents and children who are reading Jesus Calling, and the kids devotional too. Parents and kids who are being influenced by the kids version of Jesus Calling, titled Jesus Calling: 365 Day Devotional for Kids, are getting much more than they bargained for. They are also getting a lot more than the straight words of Jesus of Nazareth as are found in the Bible. Sarah Young’s mystical New Age rendition of “Jesus Calling” us has been “adapted” by Tama Fortner. In the Jesus Calling devotional versions, “special thanks” is given to Kris Bearss “for her work on the “journaling prompts.” Three ladies and a New Age book! Reading the kids version of Jesus Calling (or any version for that matter) and then trying to “journal” and feel “The Presence” of Sarah Young’s “Jesus,” through utilizing the “journaling” versions of Jesus Calling, is a recipe for spiritual disaster. This type of spiritual practice can induct one very quickly into Gnostic perversions of Scripture and/or direct spirit contact with entities that are not, shall we say, human-friendly (i.e., demons). Sarah Young’s Jesus Calling material appears to be the fruit of contemplative prayer mixed with romantic mystic impressions, creatively written as if from God. Mixed with New Age “Consciousness”/”Oneness” philosophy (which apparently is coming from her “Jesus”), this alleged “Presence” of God/Jesus expresses itself in Young’s book as “My Presence.” Vast volumes of Jesus Calling literature in the marketplace today reads much like “channeled” literature in occult bookstores. Both are sprinkled with the name “Jesus” and both include many Bible verses. It is not hard to find this material at all if one knows what to look for and where to find it. Before reading further, please carefully note the following. Irrefutable evidence proving that there are New Age teachings in Sarah Young’s book can be thoroughly examined in Warren B. Smith’s excellent work titled “Another Jesus” Calling: How False Christs are Entering the Church through Contemplative Prayer. One can also read the Critical Issues Commentary, Issue Number 125, online. This issue titled Toxic Devotion: A Review of Sarah Young’s – Jesus Calling is a thoroughly scriptural and concisely written refutation of Jesus Calling. There is also an extensive list of articles at the end of this article you are now reading. Click here to continue reading. The Bible’s Abraham an Idolater? Jesus Calling describes the biblical patriarch Abraham as an undisciplined son-worshipper and idolater. Abraham, like all of us, was not sinless, but Sarah Young and her “Jesus” have greatly misconstrued him. This biblical figure was not guilty of “undisciplined emotions,” “son-worship,” and “idolatry.” In what can only be described as extra biblical New Age revisionism, this account by Sarah Young’s “Jesus” is as bizarre as it is heretical. Contrary to what one would expect, this obvious disparagement of the person and character of Abraham by Sarah Young’s “Jesus”—along with a number of other critical issues—has not diminished the books popularity. It remains a top-selling Christian book and was the #5 best seller of all Amazon books sold in 2013. Apparently most pastors and Christian leaders are either unaware, unconcerned, or unwilling to make any comment about some of the controversial messages found in Jesus Calling—reputedly conveyed to Sarah Young from Jesus Christ Himself. Next: Sarah Young describes how she was inspired to get messages from “Jesus” after reading a channeled New Age book. 1. Sarah Young, Jesus Calling (Nashville, TN: Thomas Nelson, 2004), p. 246, ISBN: 978-1-59145-188-4 (hardcover). 2. Sarah Young, Jesus Calling (Nashville, TN: Thomas Nelson, 2004), p. 246, ISBN: 978-1-4003-2011-0. The information in the article above can be found in Warren B. Smith’s new book, “Another Jesus” Calling. LTRP Note: This particular interview took place in 2013. However, this coming Friday, November 14, 2014, Warren B. Smith will be returning to Stand Up For the Truth where he will be talking about Jesus Calling. By special arrangement with Lighthouse Trails, Stand Up For the Truth will be giving away free copies of Warren's new Booklet Tract, Changing Jesus Calling, to the first ten callers on the show. Many people are attempting to hear the voice of our Savior speaking to them, thanks to a wildly popular book franchise you probably have heard of. The “Jesus Calling” book was written nearly a decade ago by author Sarah Young, who practiced a contemplative prayer method and actually heard a voice speak to her. She wrote down everything the voice told her to and published her first book which has now sold over 9 million copies and is ranked #1 on the Wall Street Journal Non Fiction Bestseller list. Its product list includes books for women, teens, a children’s version, calendars, devotionals and even a smart phone app. We have some concerns that many people are turning to their own experiences over the real Truth that God promises can be found in the Scriptures. Today’s Episode (from 2013): Click here to listen to the interview. The Jesus Calling Resource Pack consists of one book, "Another Jesus" Calling and 4 Booklet Tracts—So You Want to Practice Good Contemplative Prayer: What's Wrong with That?, Changing Jesus Calling: Damage Control for a False Christ, Is Your Church Doing Spiritual Formation? (Important Reasons Why They Shouldn't) and Lectio Divina: What it is, What it is Not, and Should Christians be Practicing it? Normally this would be $20.75 to buy each of the items individually. The Jesus Calling Resource Pack is just $15 (for a limited time only). 10 Booklet Tracts: Changing Jesus Calling: Damage Control for a False Christ. Normally, $19.95 if bought individually. Buy this 10 pack for $12.95 (for a limited time only). Call 866/876-3910 or e-mail sales@lighthousetrails.com for a quote on bulk subscription shipping costs. For various addresses, just order single subscriptions. If you are a subscriber to the Lighthouse Trails Research Print Journal, it may be time for you to renew your yearly subscription. To RENEW your yearly subscription ($12/year), click here. You can renew your subscription at any time. Just indicate on the store which month you want the renewal to start. If you can't remember when you subscribed, we'll double check when you renew and make sure the renewal starts on the right date. If you have any questions, you can call us at 866-876-3910 or e-mail at editors@lighthousetrails.com. You can also renew by mail (see address at bottom of page), by fax (406-889-3633), or by calling. To subscribe to the journal for the first time, click here. AND DON'T FORGET TO CHECK OUT ALL OUR BOOK AND DVD SETS. As a way to say thank you to our readers and customers of our catalog and online store, we are offering, indefinitely, to our U.S.A. customers a $5 flat rate shipping on all orders (you can choose a lesser rate for smaller orders). When you get to the third step at check out, just choose the FLAT RATE shipping option. Click here to enter store.